Montreal in spring is much like Vermont. Not quite free of winter. I went there two weeks ago with three dear friends. We go there every spring to eat, hang out, browse, and discover. We’ve been doing this for 12 years? 15? We’re not sure. We tend to go back to favorite places, and occasionally something new sneaks in. 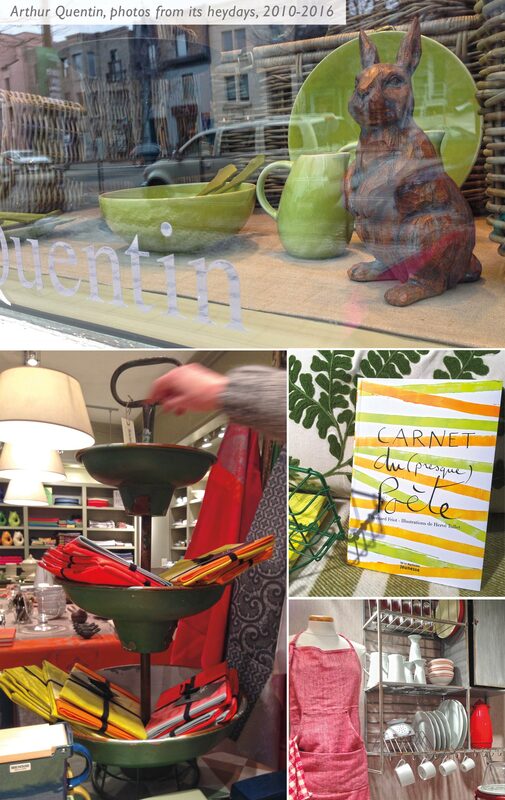 Through the years we’ve looked forward to Arthur Quentin because the wares are mostly French and not the usual stock of American cooking shops and catalogues. None of us could afford many of the delights of this shop, but this was the créme de la créme of window shopping for all of us. Three small rooms brimming with delights. I possess a citron yellow-green tea towel, a heavy slotted spoon, some Duralex glasses and a glass bottle of French hand soap (rationed to last—especially now) that came from Arthur Quentin. Friday evening we were all bummed out that an era had come to an end. But—heck, we were in Montreal, and among friends. We’re all in our early 50s and know that things change and we must change with them. Fast forward to Saturday afternoon in Old Montreal. We wanted to get croissants and bread to take back to our pad for Sunday breakfast. We asked where to find a nearby bakery and were directed to L’Amour du Pain. We found the boulangerie looking out on the Place d’Youville (a fun word to wrap our Anglo tongues around) and walked into a space filled with suspended balls of moss sprouting plants, bowls of succulents, sills brimming with cacti, shelves of enamelware and pottery, displays of earthy dishes and linens. To one side the bakery, with comfortable couches and tables and chairs. To the other side the product displays. 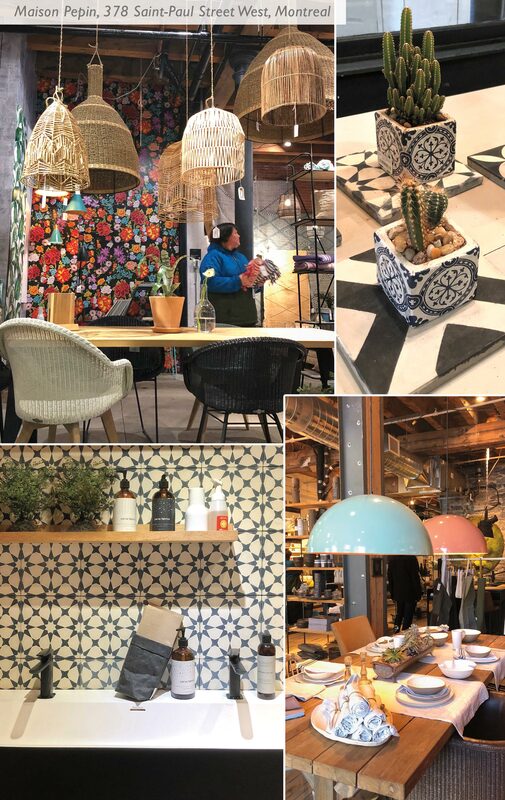 A wide hallway led through Moroccan-made tiles into another space of furnishings, house-designed wallpapers, and all sorts of delights I’ve forgotten. This was Maison Pepin, the mothership of this new universe of beauty. We almost forgot to buy the bread and croissants (but, don’t worry, we didn’t). We each came away with something special from Maison Pepin: pillows for one, a lovely tile for another, another chose linen hand-towels and—for me—an enamel shelf (just what I’ve imagined to mount above the tub). When paying, we met Lysanne Pepin, the heart and soul of this enterprise and she was welcoming and friendly. Just like her shop. Arthur Quentin, we’ll always miss you. But Maison Pepin has softened the blow completely. We’ve landed in its soft, warm embrace and we feel certain it will be here when we come back. I love discovering new shops! We spent a weekend in Bristol and I was lucky enough to be shown around by a friend who lives there. It was very inspiring to see such creative displays and speak to fellow makers in a city I had never visited before. Couldn’t agree more! There are good places popping up in nearby towns all the time. Very inspiring. What a great time of year to go on a trip! The colors alone must have been worth the journey — not to mention the bread and croissants!